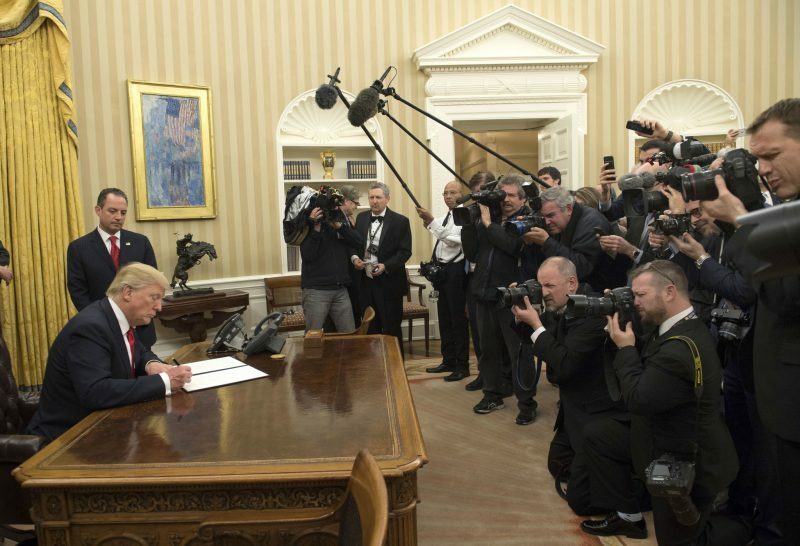 Trump loves the hoopla of signing executive orders. Too bad for him that many will never be enacted. In the early days of his presidency, President Donald Trump has been signing orders willy nilly, as soon as the papers are placed in front of him. But just because he signs them doesn’t mean they’re going to happen. Building his famed wall between the U.S. and Mexico, and boosting border security in general. Reviewing and relaxing manufacturing regulations. Reinstating plans for the Keystone XL Pipeline and the Dakota Access Pipeline. Promoting “Made in the USA” pipelines (apparently Trumpland didn’t know that foreign-made steel was being used in these pipelines). Scrapping the Trans-Pacific Partnership, or TPP (China really liked that one! It will give them a lot more leverage with trading partners). Streamlining environmental review of infrastructure projects. Providing “relief” from the Affordable Care Act. Reinstating a stricter abortion policy to ban U.S. funds for foreign entities that perform or promote abortions. Freezing the size of the federal workforce. Banning travel from seven majority-Muslim countries, including all refugees, now rejected multiple times in court (two attempts at a ban). Remember when Republicans in Congress and right-wing media constantly complained that President Obama was acting like a “tyrant” every time he signed an executive order? Yeah, those voices are pretty quiet these days. Here’s the thing, though: It’s going to take a lot more than Trump’s signature for most of these measures to make them happen. Remember that one of the first things Obama did upon taking office in 2009 was to sign an executive order closing the prison at Guantanamo Bay. Congress blocked providing funds for any closure and blocked transferring any of those prisoners to prisons within the United States. Eight years later, Gitmo is still open, and Trump vows to expand it. The border wall — Trump’s signature issue and the subject of full-throated calls by his campaign crowds to build it and have Mexico pay for it — will cost an estimated $12 billion to $15 billion. Even those estimates are probably low, and Mexican officials have been clear that there’s no way in hell that they’ll give a penny for the effort. A Republican Congress that screamed every time President Obama wanted to spend anything on infrastructure or on any of his signature initiatives may not go along with this huge expenditure, either. House Speaker Paul Ryan was all smiles about Congress passing a spending bill for the wall, but with no details about funding. Many of his fiscally conservative House members basically said, “Not so fast.” And with no new source of revenue for the wall construction, that would add bigly to the nation’s deficit spending. Trump’s press secretary, Sean Spicer of “alternative facts” fame, floated a 20 percent tariff on all Mexican goods coming into the country to pay for the wall. Trumpland quickly dropped the idea within hours, no doubt when media started reporting that the 20 percent charge would be paid by U.S. taxpayers. Never mind the fact that much of our produce in winter months comes from Mexico; those goods would have a 20 percent surcharge, affecting nearly all U.S. consumers. The Trump team obviously didn’t think through all of the ramifications of floating payment ideas. Headlines like “Families paying 20 percent more for groceries” aren’t the kinds of coverage the White House is seeking. This demonstrates the biggest problem with Trump’s executive orders. It’s amateur hour. The actions are being written by his advisers — many by white nationalist adviser Steve Bannon — who have no idea how to implement actual policy. They’re still thinking in campaign mode, not governing mode. As soon as Bannon can write them, Trump signs them. Details and the effects of the orders be damned. But it gives Trump a chance to look like he’s in charge, much like the new president of a company does in making changes just to show who’s boss. It also brings to mind the image of a dog or a wolf marking its territory. And here we thought we were finished with imagery involving Trump, Russian hookers, and urination. Many of the sweeping actions President Trump vowed this week through his executive orders and proclamations are unlikely to happen, either because they are impractical, opposed by Congress and members of his Cabinet, or full of legal holes. The reality — that yawning gap between what Trump says he will do and what he actually can do — underscores his chaotic start, which includes executive actions drafted by close aides rather than experts and without input from the agencies tasked with implementing them. Border security yes, tariffs no. Mexico is 3rd largest trading partner. Any tariff we can levy they can levy. Huge barrier to econ growth. Simply put, any policy proposal which drives up costs of Corona, tequila, or margaritas is a big-time bad idea. Mucho Sad. Oh, Senator Graham. Don’t you know that you always need an exclamation point after using “sad” in a tweet? Sad!